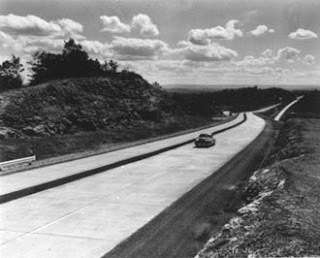 The WV Turnpike between Princeton and Charleston might just be West Virginia's most haunted roadway! It is plagued with many unusual happenings, ranging from phantom hitchhikers to strange lights to even UFO sightings. These are just some of the things that have been reported since the 88 mile long turnpike was opened for business on November 8, 1954. Although the entire stretch of road is known for its haunts just as much as its known for its treacherous terrain, the bulk of the supernatural activity seems concentrated on a 15 mile stretch between Beckley and Mossy. Along this area, there are numerous reports of strange occurrences, many coming from state troopers. In two separate incidents involving two different troopers, a phantom hitchhiker has been picked up, only to disappear in the back seat of the police cruiser. One hitchhiker, a young man, was arrested (since hitchhiking on the highway is illegal) and put into the back of the trooper's car. When the trooper turned around, the man was gone, leaving no trace except for the now-empty handcuffs lying on the seat. The other 'hitchhiker' was a little girl who also disappeared. She was found wandering the side of the road, not talking. In a similar scenario as the young man, the trooper put her in the car, turned to check on her, and she was gone without a trace. 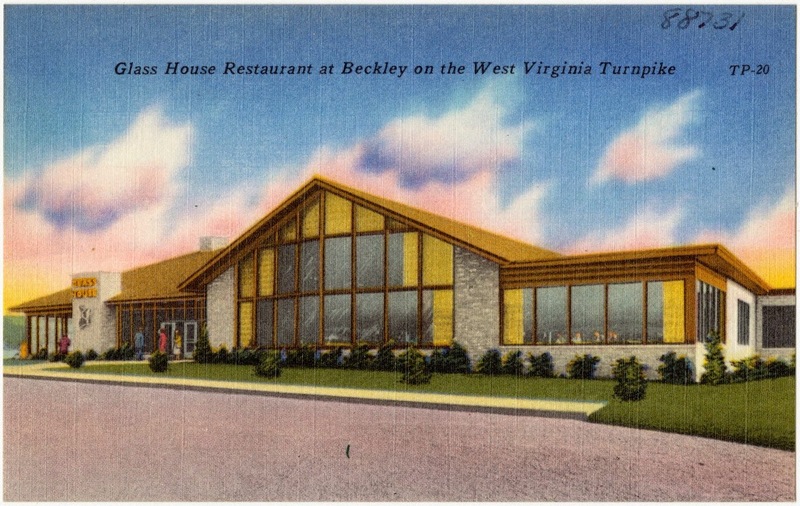 Besides the actual road itself, the old Morton Truck Stop, also known as the Glass House restaurant (now torn down) was reported to be haunted and became sort of a collection point for travelers to tell their own stories and experiences. It wasn't the only haunted building, though. In fact, a maintenance building near Nuckolls may have been the most severely haunted location associated with the entire turnpike! 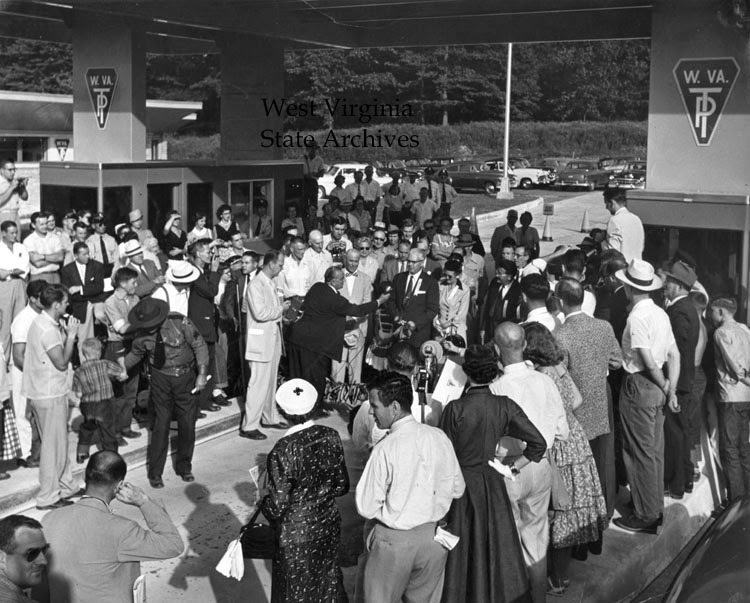 Before it was torn down, the building housed heavy machinery and served as a fueling station for state vehicles. However, despite there usually being very few people around, the building was constantly harassed by mysterious lights turning on and off by themselves and even FLOATING through the building. Loud bangs and other strange noises were also commonly experienced by many people associated with the building. The weirdest (and grossest) thing to happen, however, was an employee who had parked his van at the maintenance building came back to find that someone (or some THING) had put human feces in the backseat. The employee swears no one living was around to pull off such a prank. Many old family cemeteries were paved over or moved in the building of the highway which began in 1952, and at least 5 workers died in its construction. The highway runs along the sites of several major floods and mine disasters, and countless automobile accidents that have occurred along its span over the years, so perhaps these facets have something to do with the hauntings. By 1975, 278 people had been killed along the turnpike, with an additional 28 fatalities happening in 1979 alone! Much needed upgrades and safety repairs occurred in the 1970s, and since then, reports of activity have lessened significantly, but they still do happen from time to time. For example, my mom and I had our own phantom hitchhiker story along this road a few years back. We were visiting my grandmother in Beckley and passed a scraggly looking young man wearing dark clothing and carrying an olive green army-like sack. This was an area where there were no exits for many miles in either direction, and we never saw a broken down car or anything in the area. We both looked in the rear view mirror as we passed him, but he had mysteriously vanished. We turned around at the nearest spot in the road and went back, just to satisfy our own curiosity, but we never did find him again and saw no place where he could have been, nor no cars which could have picked him up.Was he the same young man picked up by the state trooper years earlier...or just simply a guy trying to make his way to his next destination? What's in Store for Theresa's Haunted History? Ghost Hunters on South Park! Do You Want to be Shaved?